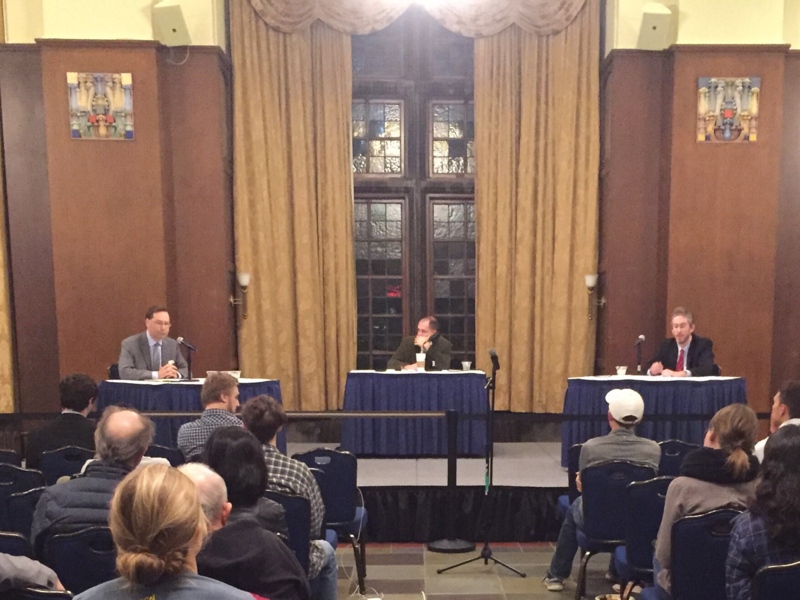 On the evening of October 13th, the Michigan Review hosted a debate between Hans von Spakovsky, senior legal fellow at the Heritage Foundation, and Bryan Caplan, economist and adjunct scholar at the Cato Institute. The event, which was held at the Pendleton Room in the Michigan Union, focused on the topic: “Does President Trump’s immigration agenda harm America?” The debate was moderated by Washington Examiner columnist, Tim Carney, who managed the speaking times of the debaters and the following Q&A. Over the nearly hour-long debate, Caplan consistently voiced doubt regarding President Trump’s competency, commenting at one point that the President is “so intellectually lazy and irrational, he cannot keep his own stories straight.” He continued to argue that “the overall economic benefits of immigration are enormous,” noting that immigrants are significantly more productive in America than in their home countries. Caplan made a special note of including this economic productivity to both high and low skilled workers, arguing that low-skill immigrants work in jobs that increase our economic growth. Seeing no significant difference between illegal aliens and legal immigrants, Caplan stated that he hoped to see illegal immigration end by it becoming legal. Although he believes that Trump’s proposed immigration policies “pander to popular prejudices” and would harm our nation, he does not think it is likely that his policies will be enacted. Although Spakovsky noted that legal immigration is a benefit for our country, with his own parents immigrating to the U.S. as WWII refugees, he argued that illegal immigration has massive net costs for our tax base, citing a figure of 6.3 trillion dollars. He argued that the current immigration system is not broken, but the laws are not being enforced, pointing to sanctuary policies in cities like San Francisco and Ann Arbor that provide a haven for illegal immigrants. Spakovsky contends that sanctuary policies grant immunity for criminals as they are guarded from federal policies, allowing them to evade the law. After the two debaters finished speaking, a Q&A followed, providing audience members the opportunity to pose questions to the two speakers. In an event covering such a contentious topic, Caplan, Spakovsky and the audience members engaged in productive civil discourse. For those that missed it, a full video of the debate can be found here.